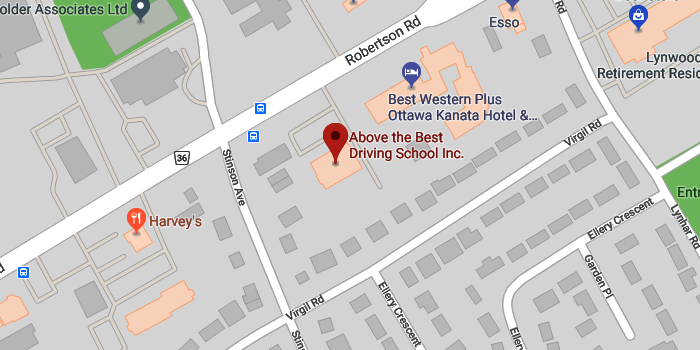 Welcome to Above The Best Driving School, Ottawa, Canada. We have been serving the Ottawa region since 1983. Join our team of expert driving instructors for an excellent learning experience. We are a Ministry-Approved BDE (Beginner Driver Education) Course Provider. We also offer many other in-car training programs. Our instructors will guide you towards becoming a competent, responsible, and an artful driver. We have been accredited by the Better Business Bureau of Ottawa with an outstanding A+ Rating, which speaks volume for our dedication for providing driver training classes in Ottawa. Above The Best Driving School has been ranked among the top driving schools in Ottawa. As of 2019, we have served over 40,000 satisfied customers in Ottawa! Below you can find our Ministry-Approved BDE Course details. This course includes 20 hours in class, 10 hours in-car, and 10 hours of home-link training along with the MTO Approved certificate. We are accredited by the Better Business Bureau with an outstanding A+ Rating! I would highly recommend this Ottawa driving school to any new drivers looking for a comfortable and professional learning environment (Jamie Burton,Ottawa).